Off Gulf Blvd, the barrier Island road winds down into the quiet subdivision of Bay Point Estates - a neighborhood waterfront community. Only 3 min. bike ride to Gulf of Mexico. Exotic landscaping recently upgraded & xeriscaped w/ drought resistant foliage. No more than 150ft beyond property is the view of the Intercoastal waterway. 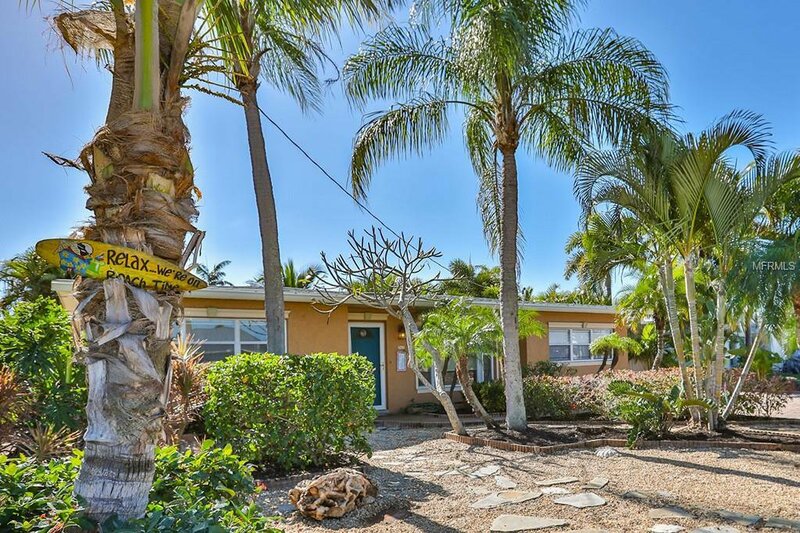 Enter remodeled, furnished 3 bed/2 bath 1300 sqft Island style home to an open split plan; 2 bedrooms w/ guest bath to your left & totally private Master ensuite to the right. Freshly painted Caribbean colors w/ crown moldings to complement the Island vibe. Travertine tile flows throughout Master Suite, into the Master Bath w/ generous size shower. Kitchen w/ pass through window bar, quartz countertops & custom tile finishes, stainless steel appliances & custom chestnut cabinets. Separate dining room w/ Bahamian style furnishings, laminate flooring continuing into bonus/Florida room area. Ceiling to floor sliders open up to entertaining area. Outdoor living areas & furnishings w/ palms & tropical landscaping. Added bonus of outdoor style kitchen, featuring installed gas grill island counter, stainless sink & built in fridge. Grill your catch & live the lifestyle of the best beach living. Ample parking in front & low maintenance yard. For small, non-mandatory fee of $185/yr, Bay Point Estates Association Members can enjoy boat dock & ramp w/ dog park! Close to retail, dining and entertainment such as outdoor festivals and local fresh fish markets. New roof ('17), New A/C ('16).